Create a new document 512 x 512 pixels. Make a new layer and fill with white. Make foreground ink black and background white. Make a copy of this layer to work on. With the elliptical marquee tool make a circle selection 475 x 475 in the centre of the image (use shift when dragging selection to keep it circular). 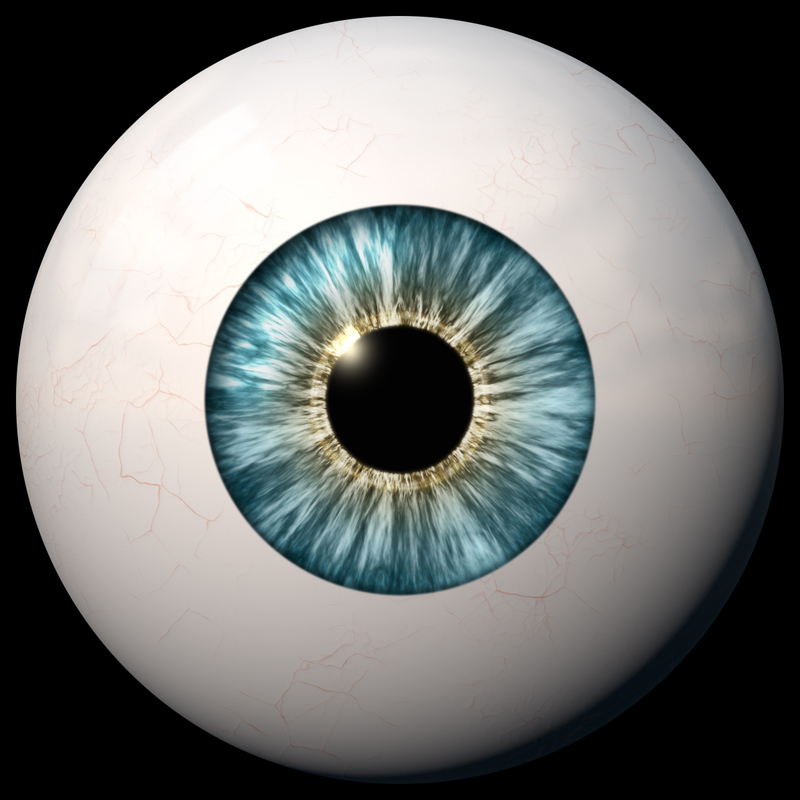 Create a transparency mask so the centre of the iris pattern is showing. Remember the other layer you hid? Copy that into a new document. You should now have a long stretched cloud. With the Rectangular Marquee tool select an area 512 x 512. Copy back into original document. You no longer need the second document. Create a transparency mask as before. to get the circle selection back, make a new layer and fill the circle with black. Hit delete. A softened dark outer ring should remain. Set Layer Adjustment to Color. Make a transparency mask As before. Now we have the basic structure for the iris. Time to move on to the pupil. Make a circle selection 185 x 185 centre screen, and fill with black. Set layer adjustment to Multiply. Set layer Opacity to 75%. You now have a blue iris and pupil. All you need now is an eyeball to set it in. Open a new document 1024 x 1024 pixels. Make a circle selection 950 x 950 and move diagonally up and left until the top left curve is outside the canvas. Make a circle selection 950 x 950 centre screen, and invert selection. Delete the area outside the eyeball. This should leave you with a soft pink crescent. Now all you have to do is combine the eyeball and the iris. Group all the layers in the iris document and drag into the eyeball document. Place in the middle and voilla!